Here are some ideas we picked up on a site visit to the AO contact centre in Bolton. 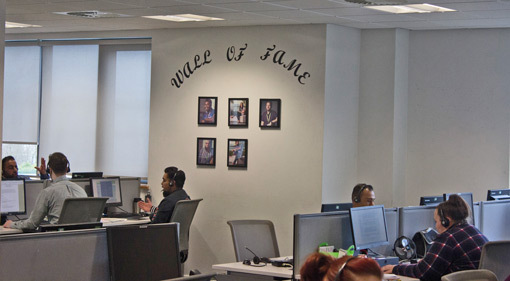 When walking around AO’s contact centre, you will notice a lot of art on the walls, which mostly represents the five values that the company wishes its staff to work by. These principles are: caring, driven, fun, bold and smart, and they can be seen in the image below. AO urges its advisors to always remember these values as guiding principles when interacting with customers. This does not mean that the company gives prescriptions of what you must say and do when one certain situation arises, but simply reminds advisors to be conscious of being caring, driven etc. One example that David Atherton, Director of Customer Experience at AO, uses to assert this point is of a delivery person. Instead of saying “Washing machine, love”, say “Hello, Mrs Smith, I have your washing machine.” David notes that the second remark is much more caring, whilst the first can easily be construed as being impolite. A whole section of AO’s contact centre is designated to advisors who handle live chats and emails at the same time. Good examples of customer live chats and email interactions are then held on to and logged by the advisor, who can then pass them on to a team leader. This helps AO to harness the voice of the customer, allows advisors to highlight their own good work, and gives team leaders and managers the opportunity to log well-received answers to questions into the company’s Frequently Asked Questions section on their website. This section now has a database of over 800 examples. AO have streamlined their IVR system to take the customer through the most efficient route of service, based on the stage of the customer journey. This allows efficiency to be maximised and customer effort, in terms of the customer having to spell out their query, to be reduced. So, an example of how this would work is on the day before delivery, you just provide the information on time of arrival, then the customer would have the option to book a different delivery time or be put through to the advisor. After an interaction with the company, AO send a brief Net Promoter Score (NPS) survey to the customer. The survey asks: “How likely is it that you would recommend our company to a friend or colleague?” with answers ranging from one to ten. 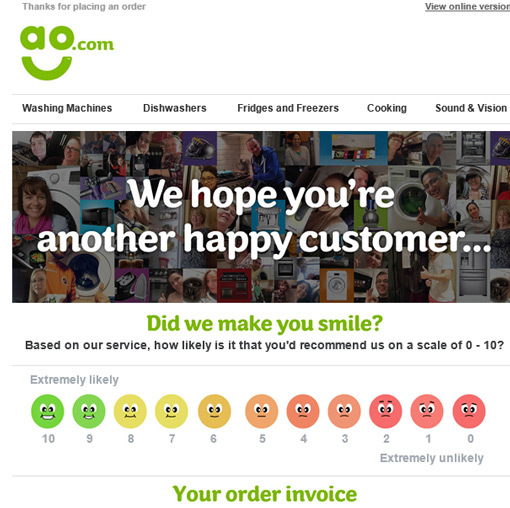 This scale is highlighted by emoticons, with a green, delighted face signifying a score of ten and a red, disgruntled face indicating a one score, with a traffic light system for everything in between. However, they have been careful in how they implement this, as they discovered their previous scale, also of 1–10, would only appear as 1–5 on certain mobile phones. So now the scale, as seen above, moves from 10–1 from left to right instead of from 1–10. AO discovered this by calling everybody who scored an eight or below, the so-called neutrals and the detractors of the business of the NPS scale, to see what more they could do for customers in the future. Also by text message, AO often ask customers to describe the advisor who handled their request in just one word. The answers given are then categorised as negative, neutral, good or excellent, which can help when monitoring the performance of advisors. This technique is not only used to highlight candidates who may require additional coaching, but to emphasise which advisors deserve acknowledgement and even a reward. David used the example of the customer describing the advisor as “helpful”, to highlight how the system works. When it comes to recruiting advisors, AO focus on finding “people that care”. So, AO include games, such as working as a team to make toy cars out of empty plastic bottles, when recruiting to pick out individuals who are optimistic, proactive and natural. 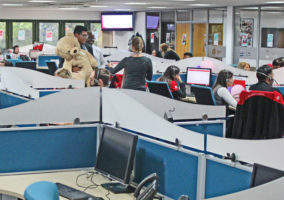 Whilst attrition has never been a major problem at AO, they have implemented a “rookie pod” with the intention of easing new employees onto the contact centre floor. 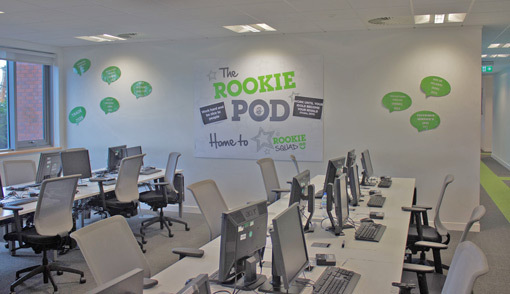 This pod is a training contact centre space for new advisors where they are initially set low targets, gradually increasing over the course of twelve weeks. After this time, the new recruits can join their more experienced colleagues in the rest of the contact centre. 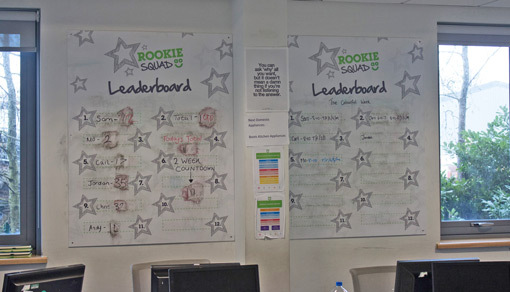 The area includes leader boards, posters and more, as seen above, and could be an invaluable addition to a contact centre that has high levels of attrition amongst new recruits. In training, AO teach new advisors who sell over the phone to use the “feel, felt, found”method of dealing with objections. This includes a demonstration of empathy, reassures the customer and involves personal pronouns, which can all benefit the sales process. For similar advice, read our piece on Top Tips for Selling Over the Phone. More training guidance can also be found if you visit our page: 50 Call Centre Training Tips. Having gathered customer feedback through the method stated in point 4, AO make sure that they acknowledge advisors and ensure that their work does not go under-appreciated. 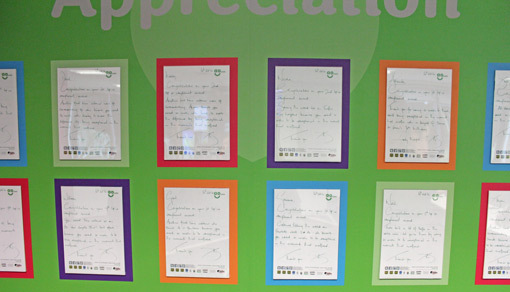 So, AO’s CEO John Roberts writes a letter to the exceptional advisors highlighted by the feedback, which are then framed and placed on a specially designated wall. Having this type of reward system in place can also provide motivation for an advisor to improve their personal performance. 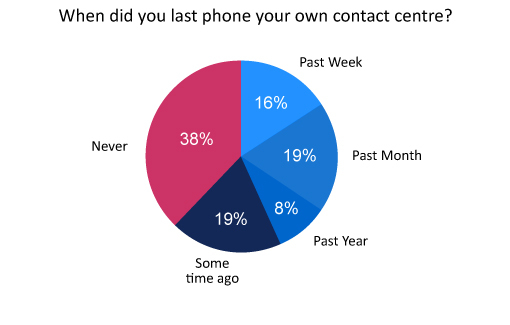 In 2016, Call Centre Helper discovered that 38% of contact centre professionals had never called their own contact centre, which could possibly affect their understanding of how to support advisors correctly. However, AO make sure that they avoid this pitfall by following a different customer journey every week, to see if each process works as smoothly as it could. In addition, the AO contact centre gives wall space to flow charts, as seen below, which follow these customer journeys, to remind advisors of the processes that customers follow and the outcomes they wish to achieve. Giving back to the local community that surrounds your contact centre, where most of your advisors will live, is likely to be recognised and valued by your employees. 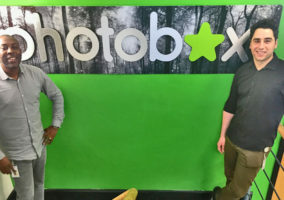 This is a principle that AO stick to, working with organisations such as Bolton Lads & Girls Club and St. Barnabas, by offering staff two paid days each year where they can work with these charities or one of their choice. These are called MAD (Make A Difference) days, and they coincide with other charity activities that are part of AO’s development programmes. This year, these ‘other activities’ include being part of the “Call Centres – Comic Relief” initiative. Increasing agent salaries is not always practical, so AO have introduced initiatives that help to make advisors’ money stretch further to boost morale. 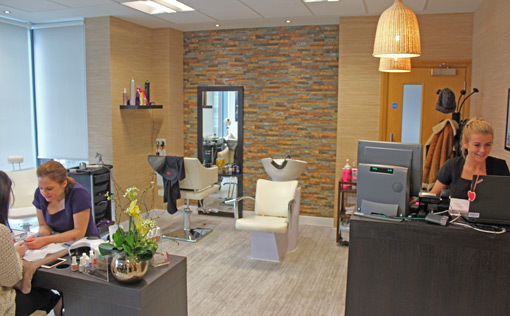 One prominent initiative was to create a full-time spa at its Bolton headquarters, where staff can have their hair cut or nails done. This means that staff can align duties in their outside lives conveniently with the contact centre. Another interesting idea AO have embraced is a £2 gym membership in the complex located just on the other side of the road. Yet, that is not all, as they also provide special deals for the in-house spa, masseuse, and nail salon. 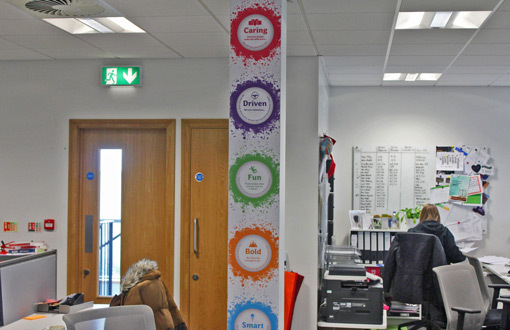 As mentioned previously, the five company values: caring, driven, fun, bold and smart, are denoted by artwork and decoration deployed around the AO contact centre. What would Ann Robinson say? These were just few of the examples that we heard on our short visit to Bolton, which made it clear that AO used mottoes like those above to replace scripts with guidelines and create a proactive culture in the contact centre. Another initiative that AO run is to offer a reward to those who provide an excellent customer service in “moments that matter”. Nominations for the advisor who receives this monthly award can come from anybody and anywhere, but AO ensure that the reward is an experience tailored to the interest of the advisor. The idea of winning an experience and not a product is to create positive memories that the winner will associate with the contact centre, which could consequently boost morale. It is important to AO for advisors, especially when working long shifts, to maintain a positive mindset that can only benefit their approach when it comes to enhancing customer service. So, AO’s contact centre has an on-site Starbucks with discounted prices, a subsidised canteen and a selection of free fruit. 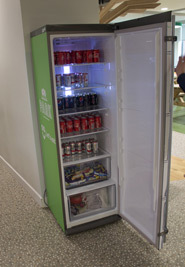 Having this in place also allows team leaders and more senior managers to feel more assured of the well-being of their employees. 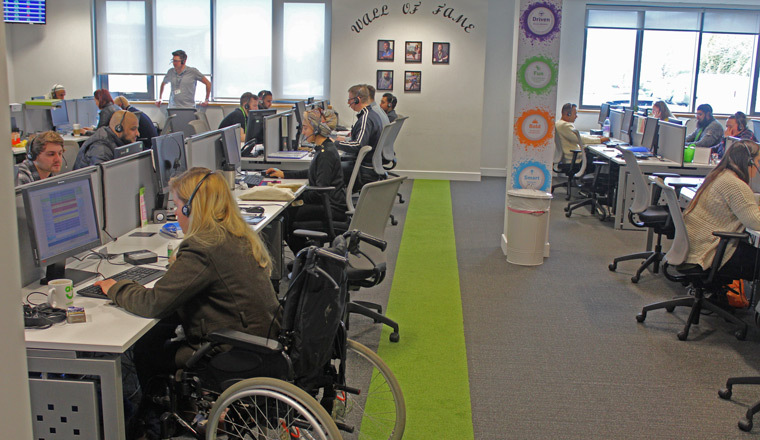 It can be difficult to instil a team spirit onto the contact centre floor, so AO have given certain areas of the contact centre a specific theme with its interior design adapted to represent that topic. 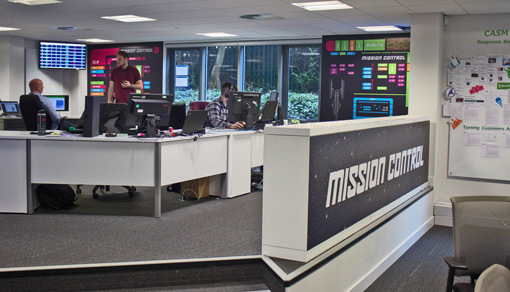 One example was called “Mission Control”, an area of the contact centre where employees would focus on KPIs and monitor advisor performance. This concept almost splits the large contact centre into small teams, which has been proven to boost productivity, efficiency and engagement. 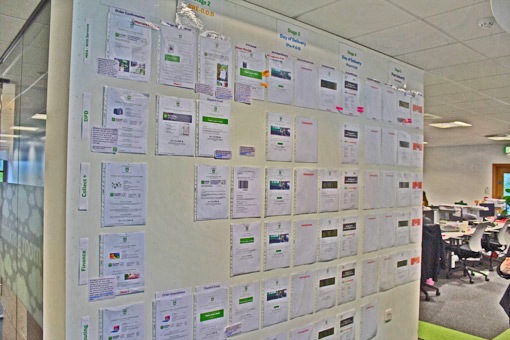 Another strategy that AO have implemented to ensure that their advisors receive the recognition they deserve is to have a regularly updated “Wall of Fame”. By dedicating wall space to include a picture of the advisor that they chose to acknowledge, AO provide their agents with a good sense of the company’s commercial performance. Also, AO could be seen to be hinting at the area in which advisors should concentrate their time and skills. Thank you to AO for facilitating our visit to their Bolton contact centre.